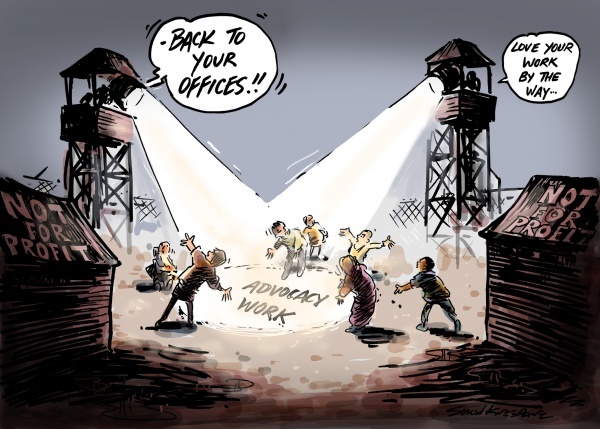 ‘Government called on to stop the war on charities’ , major Australian charities unite to oppose federal government moves to ‘silence Australians’– today’s Pro Bono News cartoon. A recent post on the Pro Bono news website reports that the Abbott Government is accused of trying to silence Not for Profit organisations. “I’d like to know why the Abbott Government has, across the board, been cutting funding to advocacy work of the Not for Profit sector,” Founder and CEO of the Asylum Seeker Resource Centre (ASRC), Kon Karapangiotidis said.